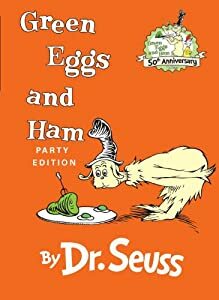 Edo Ergo Sum: Do You Like Green Eggs and Ham? Kids. Breakfast. Two great things that don’t go great together. If your home is anything like ours in the morning, then you know what I mean. For those of you spared the circus routine every morning, then good for you. I am envious. But those of you whose weekday routine revolves on using a screeching voice as a child’s alarm clock, this post’s for you. Forty percent of all adults admit to skipping “the most important meal of the day.” That rises to fifty percent for adults under 45 (read: people with kids) . According to the Mayo Clinic, adults who regularly skip breakfast are more likely to have metabolic and weight problems. Children who skip breakfast are not only likely to miss out on essential vitamins and minerals for healthy development, but also have poorer concentration, problem-solving, coordination and creative skills. But for many, time is a factor. We would all love to have a nice relaxed breakfast with a morning paper (I do); the reality is that most people are short on time in the morning. For our family, this means trying to get my non-morning person daughter and her even more non-morning person dad to get up, get showered, dressed, fed, packed up, hugged, kissed and sent to school and work – all within an hour and a half. And that is generous – I know plenty of other parents that have to do this at Olympian speeds. Who’s the loser here? Breakfast. Most parents don’t get breakfast, and when they do it is made with love, from Dunkin’ Donuts (substitute Krispy Crème, Starbucks, etc.). Your probably force your kids to eat something. And if you have a teenager - God (or whatever preternatural force you may believe in) help you. Breakfast is the probably the least of your worries. But have you really sat down and seen what is in your family’s breakfast? According to the United States Department of Agriculture (they are the US government agency responsible for nutritional guidelines for the US at large) and the US Institute of Medicine, your child should have most of their diet from complex carbohydrates and lean proteins, with no more than 20 percent of their calories coming from fat. Translation: Most easy breakfast foods are out. Muffins, donuts, cereals, frozen waffles, bagels, etc. They have far too many calories, fat and sugar to be counted on as “healthy” in any meaningful way. Other foods, such as oatmeal (the old-school cook yourself type) or an omelet take time. And that is the last thing that moms have. The nutritional and health benefits are obvious. The kids get a healthy breakfast. The children know what they are eating. Children understand the process involved in their food because they are engaged. Parents, because they are responsible for the entire class, also do their best to prepare some healthy breakfast food: whole-wheat crepes, waffles and pancakes, tiny omelets, yogurt parfaits, porridge with dried fruit. And no, just because we are in Europe, does not mean Nutella is allowed. And yes, this takes time, energy and effort. And some of you might say this is some crazy commie plot. But there is also something magical that happens at the group breakfast that is not related to bodily nutrition. It’s community. Children by preparing breakfast together realize that meals are not meant to be eaten on the fly, out of a bag or in cup form. They are a form of social interaction, just like a hug, a conversation or a smile. In a world where it is far too easy to be disengaged from society, meals are one of the few spaces left where sociality is paramount. You cannot just eat and not talk to your fellow diners (unless you dine alone and then you have a whole set of other problems). Laurie David, environmental activist and mom, has put it best: “I could never just look at a meal as a time to refuel. For me it's an opportunity to accomplish something. To connect, to teach, to share values.” And that’s what meals do – it’s the stuff that makes us human. You have kids? They have to eat. Eat with them and maybe, just maybe, all of you can learn something from each other. Yes, there is my recipe for Green Eggs and Ham. The key here is to read the book the night or day before you serve this. And have your kids help with the cooking – it’s fun! Hopefully after their first bite you will get the “I do so like green eggs and ham! Thank you! Thank You” Mom-I-am! 1. Preheat oven to 400 F. Take a bowl and beat eggs until combined. Add a pinch of salt and pepper. Place oil in a non-stick, oven-proof pan and heat oil over medium high heat. 2. When the oil is hot, but not smoking, add eggs and turn heat to low. Gently fold in chopped herbs into the eggs with a rubber spatula. When eggs are barely set, bake in the oven for 7 minutes until done. 3. Take out eggs and sprinkle the top with grated Parmesan. Cut into wedges. 4. To serve, place a piece of toast or muffin on a plate, drape ham slice on top of toast and then frittata wedge on top. Voila. Green eggs and ham. This is according to an ABC News poll http://abcnews.go.com/GMA/PollVault/story?id=762685. A bowl of raisin bran has 17 grams of sugar in it. Those Honey Nut Cheerios that sound so darn healthy? 9.6 grams Even Kellogg’s All-Bran Buds have 8 grams of sugar in them. Those breakfast bars? Don’t even go there. They are loaded with sugar. If you don’t believe me, go to Trader Joe’s or a Whole Foods and look at the nutritional information. You might as well eat a Snickers bar. I won’t go into beverages here, but a glass of orange juice (1 cup or 240g) has 21 grams of sugar. It’s on par with Lucky Charms and Captain Crunch. How’s that for magically delicious. Funnily enough, those who have issues with the government or social institutions being the “Food Nazis,” are all giant food corporations, conglomerates and their respective lobbyists. Coincidence? Just a historical note for all you “hands off my food” types: Harry Truman started the national school lunch program in 1946 as a part of civil defense and national security strategies. Starving kids don’t make good soldiers, especially in light of WWII and the Cold War. Partially due to the success of the lunch program, Lyndon Johnson also added breakfast to the school lunch program in 1966. Unfortunately, for Johnson, the programs were too late for his impoverished childhood. But both have made a huge difference in the health of children in the US. The academic in me has to point out that the formal term for this is “social capital.” Popularized by James Coleman and other social scientists (namely Robert Putnam’s Bowling Alone), social capital refers to “a variety of entities with two elements in common: they all consist of some aspect of social structure, and they facilitate certain actions of actors...within the structure”. [Coleman, James. (1988). "Social Capital in the Creation of Human Capital". American Journal of Sociology Supplement 94: S95-S120. Wellman, Barry and Scot Wortley. (1990).] In other words, it is the “stuff” that bind society together in the form of social actions, such as being a “soccer mom,” volunteering at a homeless shelter or voting. Siegel, Bettina Elias. “The Family Dinner – An Interview with Laurie David,” in a Special to the Houston Chronicle 6 May 2011. 16 May 2011 http://www.seattlepi.com/ae/books/article/The-Family-Dinner-An-interview-with-Laurie-1369696.php.